Next to the offer of plum crumble on the blackboard at the Fishguard Transition Café in north Pembrokeshire is a helpful note: ‘may contain stones’. That remark sets the tone for our visit to this pioneering enterprise, where meticulous attention to detail and a warm human touch combine to form a community project with an imaginative contribution to a town’s food system. Most of the food served at the Cafe, which offers a choice of home-cooked dishes in bright and tasteful surroundings, is supplied by local food businesses. It is surplus produce, mainly fruit, vegetables, bread and dairy, but also some meat and other items, from the no-man’s land between the much misunderstood ‘best before’ date, which marks the point at which the manufacturer estimates that it might start to lose its premium quality, and the ‘use by’ date, after which there are real dangers to health and it cannot legally be served. Perishable food in this zone is perfectly fit to eat – certainly the plums were at the peak of perfection, aromatic and sharp – but it needs to be used fairly quickly, and what is a liability for a supermarket becomes an opportunity for the enterprising bargain-hunter or in this case the community project with the facilities to handle it. Tinned and packaged foods, meanwhile, can be kept for months and even years. 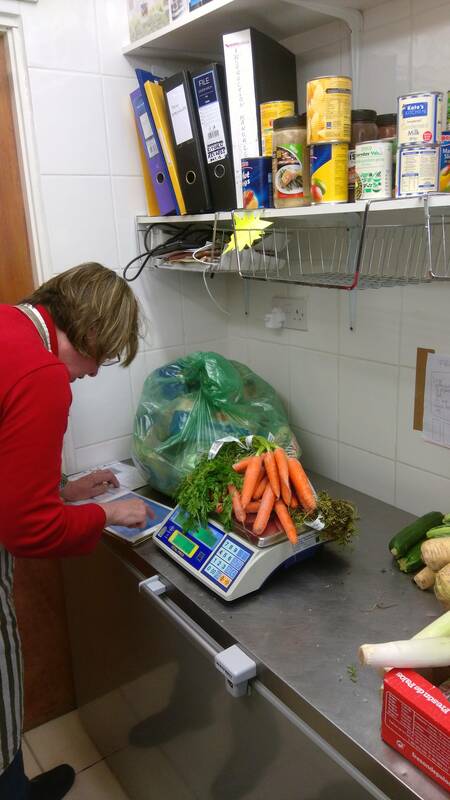 The Fishguard Transition Cafe turns surplus food – around 850 kg a month of it – into nutritious meals while also providing a space for volunteers and community groups to come together, forming a lively hub for discussions. It’s a simple concept but a complex operation. Food arrives daily and menus are planned around what’s available – the main dish when we visited was mushroom stroganoff, with roast beetroot – while some of it is frozen, preserved or pickled. Like the supermarkets which supply it, the cafe has its own waste stream, with excess food given away in the cafe, sent for composting or biodigestion, or diverted to animal feed. Record-keeping for the Cafe, as for any food business, is demanding. Besides weighing the daily food deliveries, a note is made of allergens, food that has been cooked but cannot be used immediately is labelled and frozen, and cleaning routines are checked off. It’s clear that managing the surplus food for a small town and its hinterland is no small task, but the very intricacy of it also allows for a scale of human involvement that brings opportunities. The cafe obviously makes an important contribution to improving the diets of local people who cannot afford to cook such meals themselves, although as volunteer director Chris Samra says, the stigma of ‘food poverty’ sometimes deters people who might benefit most. However, it was actually set up to reduce carbon emissions by diverting food from landfill, to the tune of an estimated 21 tonnes of carbon savings per year. It gets its name from the Fishguard Transition Group who formed in 2008 from a group of citizens who identified with a wider movement to make the ‘transition’ to a low-carbon society. They began by setting up allotments and running gardening courses, with the aim of helping more people to grow their own, together with other activities to engage the local community. In 2012 they hit upon the idea of a cafe running on surplus food, acquiring premises rent-free from the next door Coop supermarket. A plaque on the wall acknowledges donations of furnishings, equipment, labour and cash to the project, from a wide range of donors including several national chain stores, a youth club, a farm, a solicitor, a hotel and a range of voluntary and government agencies. Around about the same time, they embarked on the lengthy process of owning a wind turbine, raising loans from local residents. Generating an income from the wind is important, because the grants that helped the cafe get started are not such a renewable resource. Support by Environment Wales for a part-time project manager post, now in its fourth year, was key to getting the project started, and the Jobs Growth Wales scheme helped to get some young people onto the staff, which together with support from the group’s voluntary directors meant that they could run on volunteers to begin with. The cafe has also been supported by the Wales Cooperative Centre, who funded a business plan, and it won the 2014 Sustainable Communities competition at the Hay Festival which provided a grant. Takings have grown and it is becoming more financially viable, but it still needs grants to cover some of its running and labour costs, including some part-time kitchen staff who provide continuity for the volunteers who assist with food preparation, record keeping and service at the counter. The cafe is not just a means of turning surplus food into affordable meals. It is also a training facility, where volunteers, catering students and others with learning disabilities can acquire skills in a safe environment. It is a social hub where anyone can come for a healthy meal during the day from Tuesday to Friday, and at many out-of-hours events. It runs play sessions for families with young chidren, craft sessions for older children and adults, and drop-in sessions for Welsh learners. It also distributes food parcels on behalf of the Pembrokeshire food bank scheme PATCH, which means that some see it as a place ‘for poor people’, but it has always drawn in people from a wide cross-section of society, using food as a point of connection to drive social change. 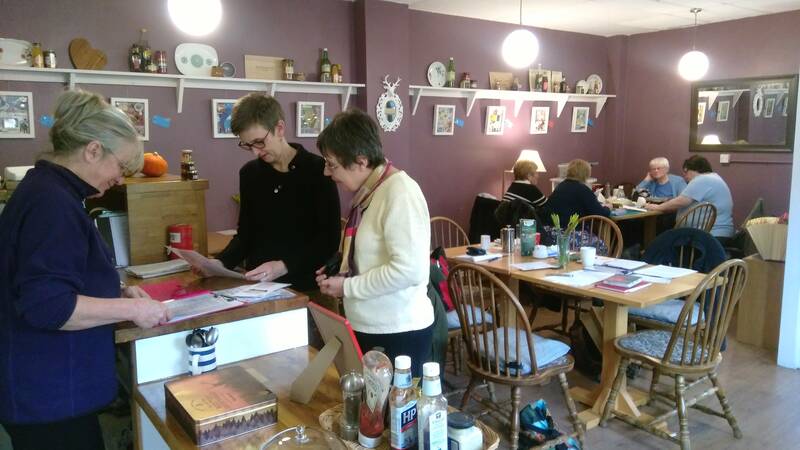 The Fishguard Transition Cafe shows what can be done when food businesses, big and small, identify with their local area (in this case, within a 15-mile radius) and make common cause with community groups, so that surplus food builds social capital. There are other examples, like the Pay as You Feel cafe in Bethesda, Gwynedd,and the Real Junk Food cafe in Cardiff , each with a different take on the theme. Wouldn’t it be great if every neighbourhood in Wales had one?